Hellebores have long been the finicky early bloomers of plant experts, but some of the newer introductions are fuss free. Hellebores are beautiful rose like flowers that are among the first to bloom each year. In warm climates they bloom so early they are known as the Lenten Rose or Christmas Rose, although they are not closely related to the rose family. Where the ground freezes of course they bloom much later. Hellebores typically bloom for at least a month. When spring warms slowly and the nights remain cooler, they will bloom even longer. The color development of the blooms can be quite dramatic, typically deepening in hue as the blooms mature. The blooms are quite large and held above the foliage, nodding down with their own weight as they open. Helleborus orientalis, the Lenten rose, is the most floriferous Hellebore and displays the most vivid petal colors. Although once considered a species, it is now believed that most Helleborus orientalis are actually hybrids. Helleborus niger and orientalis are the most commonly grown, and there have been many new and improved varieties in recent years. Commonly referred to simply as Hellebore, which is the genus name. Ideal in a moist shade garden with rich organic soil, hellebores will not tolerate much sun and heat. Low clumps of foliage will enhance the shade garden all season. If the foliage needs to be refreshed by late fall or winter, cut back to fresh growth before it flowers. 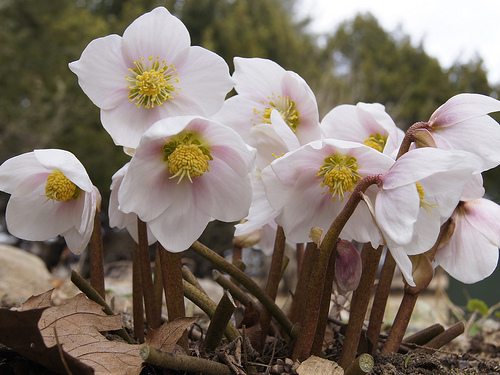 The Christmas Rose and Lenten Rose are generally hardy in zone 4 and even zone 3. However they may struggle after being deeply buried in snow. Blooming may be diminished at best, but the foliage can recover beautifully if damage is removed in spring. Hellebores form a dramatic blooming winter groundcover in a woodland setting and continue to be lovely year round with rich green foliage. Although they are slow to establish, in ideal situations hellebores may self seed and slowly naturalize. Once established they will tolerate dry conditions and neglect, but will not thrive. Soil Requirements: Prefers organically rich, moist soil. Foliage: Dark green leaves, deeply lobed, palmate, evergreen in moderate climates. The foliage rises directly from the soil without stems. Maintenance: Requires minimal cleanup from winter damage. Does not require division, divide in early spring to transplant or propagate. Other: Tolerates slightly dry soil, generally deer resistant. Toxic leaves stems and roots if ingested may also cause skin irritation. Hellebores niger is one of the Hellebores that earned the difficult to grow reputation. Hellebores orientalis is similar but easier to grow. Large cup shaped flowers are 3 inches across in glistening white. Unlike most hellebores, the blooms face outward, showing off the golden yellow stamens. The shining white blooms will light up a shade garden, held just above the foliage. The Christmas Rose loves a rich humusy soil in light shade. Once established Christmas Rose can be tolerant of dry periods and even standing water. It is best to plant them in a bed that is sheltered from cold winter winds. Allow several years for these plants to be well established. If undisturbed a nice clump will be formed. It is not necessary to divide Hellebores niger, but they may be divided to propagate. In ideal conditions they may self seed. Plant in groups or masses under deciduous trees, in shady borders or containers. ‘Cinnamon Snow’ is a glowing introduction by German breeder Josef Heuger worthy of the Gold Collection. Pink buds open to shimmering cream blooms streaked with rose and cinnamon. The very large blooms are held by bright cinnamon colored stalks and are outward facing with deep rosy cinnamon undersides. The petal coloring changes with the temperature. As the bloom matures the colors deepen and adds tinges of pinkish green. This sturdy hellebore is reported to be hardy even to zone 4 It is an interspecies hybrid cross between H. niger and H. lividus. ‘Cinnamon Snow’ establishes well and the foliage is lovely year round. Will tolerate dry shade but does prefer moist soil. ‘Harvington Double White’ is an outstanding double flowering Hellebore. Blooms are large, frilled and saucer shaped and outward facing. Beautiful white petals are streaked with dark pink flecks. 3 to 4” across, the large blooms perch atop sturdy 24” stems. ‘Double White’ is a heavy bloomer from winter into early spring with long lasting blooms brightening your shade garden. This extra large hellebore cultivar is easy to grow with lovely glossy deep green foliage. Plant in groups or masses, they will create a bright stunning groundcover in a woodland garden. The long lasting blooms are perfect for cut flowers. These early bloomers are sturdy and easy to grow in a shady border or moist woodland garden. Gorgeous shade brightening ground cover when massed. The ground hugging foliage is rich lovely green year round. ‘Josef Lemper’ blooms even earlier than ‘Jacob’, with blooms appearing by late October. This is a charming hybrid with snow white flowers and a full crown of golden stamens. In cool weather the petals warm to a rose pink, in warm temperatures they cool to pale green. The flowers face outward, borne on short dark stems. The bushy upright clump of foliage is rich dark green, leathery and serrated. This easy to grow Hellebore was bred by Joseph Heuger German breeding program, cloned for it’s long flowering period and lovely upright habit. ‘Josef Lemper’ will be an amazing addition to your woodland or shady garden. ‘Praecox’ is likely the most commonly grown Hellebore, at least before all the new easy hybrid introductions. t is an easy Hellebore that blooms by Christmas in warm regions. Pristine white blooms are typically tinged with pink or sometimes green. Each petal base is pale green. Bright stamens are prominent. Dark leathery green foliage is usually evergreen or semi-evergreen depending on climate region. ‘Praecox’ will self seed in good conditions. Do not move or divide mature plants, they prefer not to be disturbed. The most widely known Helleborus niger, ‘Potter’s Wheel’ has large 3 inch bright white petals and a showy golden crown of stamens. Pink buds open to blooms that face outward and are borne on short dark stems. The blue green leathery foliage is fresh all year. The mature plant prefers not to be moved or divided. ‘Potter’s Wheel’ will self seed if happy with conditions.